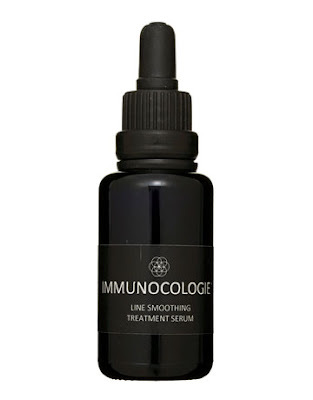 The Immunocologie Line Smoothing Treatment is a firming and perfecting concentrated serum that provides the necessary cellular support to prevent the formation of damaging radicals following biological stress. It is anti-aging, anti bacterial and gently but effectively brightening. The top of this bottle reminds me a bit of eye drops. 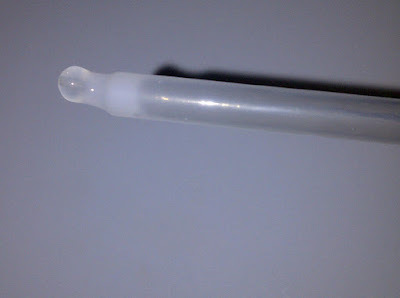 It's a rubber twist top with a small drip The applicator is very easy and it prevents any type of drips or spillage. Personally, I think more serums should be housed in a bottle and top like this, because for the price, you don't want to miss a drop! A couple squeezes on your face morning and night and massage with your fingers , and you're on your way to a beautiful younger face. The smell reminds me of the bubbles you would blow when you were a young child. It kinda brings me back to my younger years! I don't know if that's good or bad.. ha ha. This serum was also listed on Harpers Bazaar's must have list for November 2010, stating "it really works!". Before I tried this, my favorite serum was the Perricone Serum Prep ($140) Now for $30 more I can get this one, which is new my new favorite, however the sizes are a bit different. The Immunocologie is significantly smaller at 30 MLs, so I guess I will have to weigh my options, quality vs quantity. 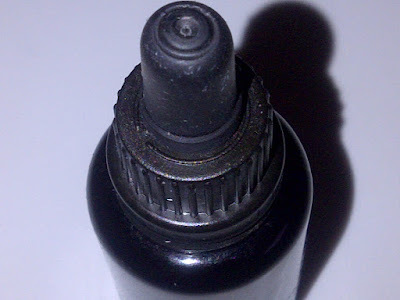 Oily skin people might not enjoy this serum as much as me, because these type of products might make you a bit shiny. I, however I enjoy this product immensely because lately my face is a bit dull and flaky. I would recommend this for anyone looking to get rid of lines on their face, and anyone who wants a brighter healthier look! Buy: You can purchase the Immunocologie Line Smoothing Treatment for $175 at Immunocologie.com. The Giveaway: One winner will win a full sized bottle of this smoothing treatment. ($175 value!) To enter, tell me why you need this and how it will help benefit you!! Good luck beauties! Fabulous prize here, giveaway ends 1/20/2011. Open to the US only. Winner will be chosen by random.org and will have 48 hours to respond to the winning email. Duplicate entries will be deleted. Disclosure: Samples were provided for consideration from PR. All opinions are my own. No monetary compensation was received for this review. I need this since I am aging under the eyes. This would benefit me by raising my self-confidence when I go outside. I suffer from dry skin, as well as from the negative consequences of rosacea (e.g. not being able to use facial moisturizers). The areas round my mouth and eyes have started to show fairly deep wrinkles. This is the reason why I would like to try this smoothing product. Thank you for hosting this giveaway. I follow you via Google Friend Connect (catalinak). I need help for my aging thinning skin around my eyes. I need this because 2 back to back pregnancies have wreaked havoc on my complexion...Not to mention the fine lines I am starting to see on my forehead and eye area! Thanks for the chance! I am 70 years old and my face is beginning to show the ravages of age. I believe this product might just be perfect for me, slowing down and probably reducing some of the agining lines. 41 and fighting cancer - recently out of treatment and isolation. my skin has suffered in ways you can't imagine, stress, radiation, age -- this product looks like it would be wonderful for me. I have lines around my mouth and eyes that this product might help. I have very noticable lines on my forhead and at the ridge of my nose (between the eyebrows). Using this would help me look and feel more youthful. I really need this because of the lines my face is showing and the dry, red, blotchy, dull skin. #2. I'm an email subscriber to Bella's Beauty Spot. I think that this would help brighten my complexion through the rest of winter. It sound like the perfect night treatment and a couple drops would be great for putting on before makeup. I need this because of the fine lines and wrinkles appearing on my face that are making me very self-concious. I need this because I am starting to see aging on my skin. I think this would be a great way to start protecting it now. With dryness and aging around my eyes I need something, anything to help and this sounds like it would work! I'm a confirmed e-mail subscriber to your blog. I "like" you on Facebook (catalina khalaj). I need this because I'm 60 and live in Vegas. "Line smoothing" is the key phrase!!! I also tend to have very dry, dull skin b/c I have sebhorrea on my face. I try all kinds of creams and serums for brightening and tightening the skin on my face so that I won't look so tired all the time. I need this because I'm seeing areas where it could really use something extra to help with wrinkles and add firming. It seems like this would be a great addition to my regular moisturizer for problem areas, and I could benefit by going a bit longer not quite looking my age. Now that I am over 40, I would love to try this because my skin has fine lines and puffiness I would love to minimize and hopefully this would help. I follow you on Blog Luvin (follower #111). I need this because I am seeing signs of early aging and this would help me grow old gracefully...or kicking and screaming. Liked on facebook (2), confirmed email subscriber (2) following Immunocologie on Twitter (2) and tweeted about this post (2). I'll be turning 26 soon and I think it's time I start being proactive and prevent wrinkles. I, too , have been using Dr. Perricone's product and would love to try this one out to see if it is better than his. I have some medium lines in the forehead and some areas around my mouth that need that prep or my makeup looks awful. I have tried the primers but I have found they work better with the line smoothing products. This is something I really need as I can't afford Dr. Perricone or any other brand right now as I am not working. I now have fine lines I'd like to smooth out. After having my first child, I definitely have teh lines and wrinkles coming out! Thanks for hosting a great contest! I need this, as I'm just now noticing some fine lines around my eyes and in my forehead area. I'm 41 and I'm constantly on the lookout for new anti-aging products. This sounds fantastic! I want to win because I committed to taking better care of my skin this yr. Sometimes I give in to the rosacea and psoriasis. My lines aren't too noticable, and I'd like to keep it that way for as long as I can. i need this to ease the aging look. I don't need this for myself (I'm 24) but I would love to give it to my mom, who is very self conscious about her skin. I would love to try this because I'm starting to see aging and thinning skin around my eyes. It's all about ME! A 64 y.o. male, wanting to look a bit younger for my 42 y.o. wife. She's been treating my dry "motorcycle skin" with various products, but this seems to be several steps up the hill from what we've been using. I would love this because I'm 51 and fighting all the way to fight lines and keep younger looking skin. I believe this product would be great for me. I would love this because I just noticed a small wrinkle creeping up across my forehead. If I use this maybe it would go away before it gets worse! I need this because I just turned 49 and my skin is showing it. I would love to restore a little bit of youthfulness to my skin. I need this because I just turned 50 and I want to believe that a skincare line can actually work! I need this because I am 50 and it will benefit me by helping slow down my furrows. GFC follower kycouple2000, entry 1 of 2. GFC follower kycouple2000, entry 2 of 2.
following sponsor on twitter as ky2here1. 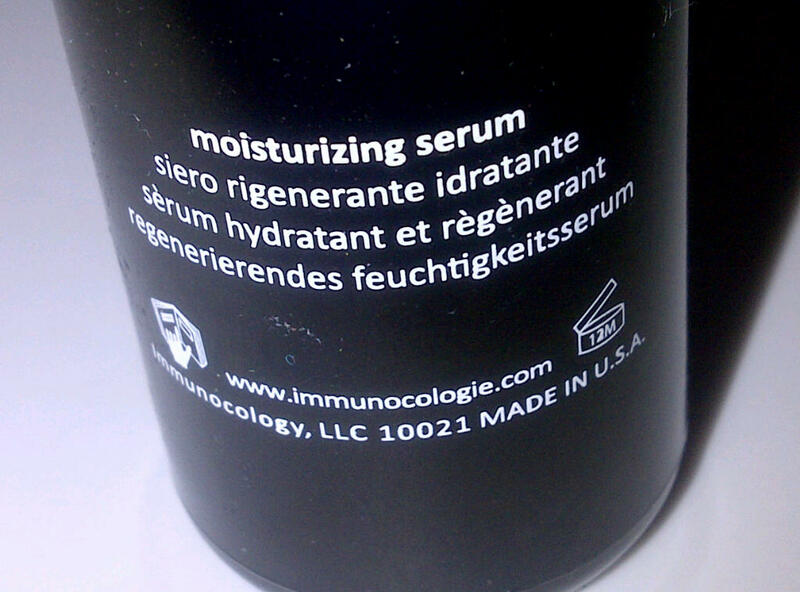 I would like to try the Immunocologie serum because I would like to have its brightening effects for my face. I would love to try this to brighten my complexion, even skin tone and reduce the fine lines around my eyes and lips. I need this because a couple of people have asked me about my son, who is in fact, my husband. His fault entirely for being so dang youthful looking! I would love to try this for the crows feet that are around my eyes.